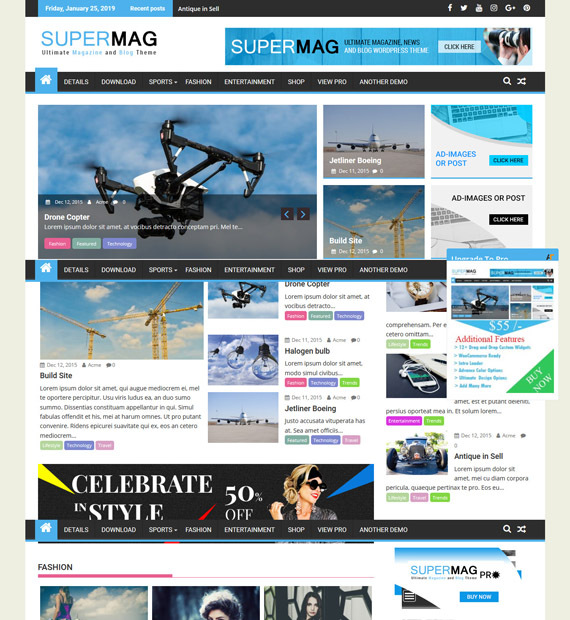 SuperMag is a highly customizable WordPress theme that can be used for news, magazine, or personal blog sites. With SuperMag, you can customize your header, footer, sidebar, main homepage or inner sections with ease. On top of that, it is advertisement ready, WooCommerce compatible and designed to work with Page Builders. This free theme also features drag/drop/reorder widgetized area, advanced custom widgets, advanced layout options, social media integration, breadcrumbs, and much more. Mix and match the pieces of content and media across your website, specifically on sidebars, header and footer with custom widgets. Redefine the design your website your way. Fully compatible and widget ready so that you can place company promotions and advertisements for your users to see increasing the traffic rates on your website. Theme built with magazines and newspapers in mind allowing the users to handle a huge amount of posts on a single page, making it visually appealing and intriguing. Built in integration with social media platforms – social sharing, social icons, and other social media features made easy! Plus, it’s compatible with almost all the social media plugins. Fully compatible with the popular WordPress Page Builder plugins for effective and easy process of creating the perfect site! Get all the information and support from the theme providers. Compatible with the official WordPress eCommerce plugin ‘WooCommerce’. Install WooCommerce, turn your website into an online store, and start selling your own products online. Get Creative! Add the extra intriguing factor on your site with the unique square or boxed styled layout that features the full width wide layout pattern. Edit,customize and stylize any element on your site according to your need and blog requirement by adding custom CSS to the backend of your WordPress site. For those international users with the native right-to-left text direction, easily get all the support required related to it from the dedicated support with the theme. Fully compatible with the popular translation widgets and plugins making your site eligible for translation to any other language other than the default. Comes with in-built Breadcrumbs, a navigational element that helps you stay in track of the location within your program, files and websites. Get Recognized! Upload any image of your liking that is perfect for your website as the official logo for your website with a click of a button easily. We collect the best WordPress themes out there. We analyze various aspects of the theme like design, coding standards, theme authors behind the theme, security standards followed etc. before publishing the theme here. So, rest assured any theme listed here is all safe and good choice for you! !